Deputy Commissioner Papum Pare district Tai Kaye ordered an enquiry into the whole episode of the incident of Jawahar Navodaya Vidyalaya (JNV), Gumto. DC informed Arunachal24 that we are constantly monitoring the situation. 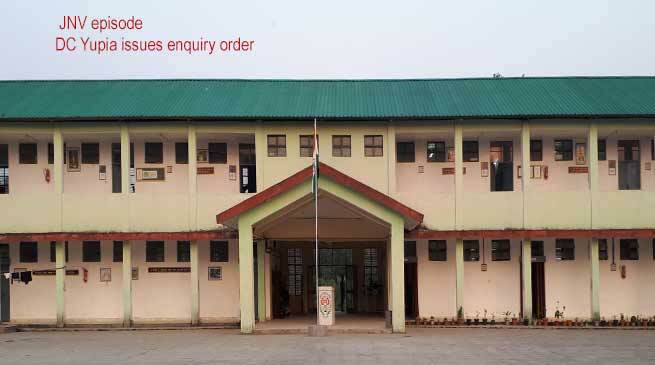 Dc further said that as per demand and circumstances I have constituted an Independent enquiry committee through SDO Doimukh Ibom Tao within 7 days who shall enquire into the entire episode and action will be initiated after the submission of the report. They also demand to take action to those miscreants who directly Inter School premises and manhandled one students of Class-VII whose right ear have been badly damaged. Meanwhile Education and Cultural development Society (ECDS) urge DC Yupia to constitute committee immediately of expert sources to check the using drug in school compounds by students as some parents has alleged in social Media. They said that It is also unfortunate that directly Involvements of parents in school premises by organizing grouping system is also highly condemnable one. The any matters within school compound should sort out with school administration and School management committee the release added.